After a gray month in the PNW, it was amazing to step off of the plane and feel the sunshine! We are in town for a wedding, to see good friends and of course to find some good eats. This trip we focused on the Long Beach area: The Promenade, Little Saigon and The Camp. Our adventure was made even more exciting because it was our daughter’s first time on a plane, staying in a hotel room and being somewhere warm! Upon arrival we were treated to some Korean burritos from Seoulmate in the LBC. OMG THEY WERE SO GOOD – both Matt and I agree it was probably the best food we had on this trip. So good that we didn’t get a picture. The Old Boy and Spicy Pork were our faves. This will be added to our usual food rotation going forward! Next stop: The Camp. After a day of traveling, we wanted something fresh and healthy-ish for breakfast on our first morning. We found the Black Market Bakery in Costa Mesa. In a word: YUM! This cute little bakery had some fantastic breakfast sandwiches, avocado toast with eggs and delicious coffee. It was the best mocha I’ve had in a long time! 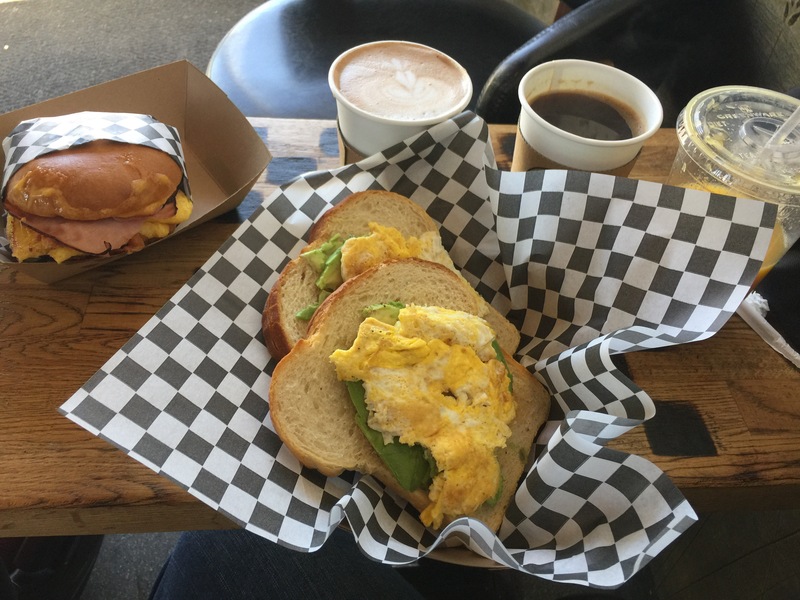 If you are in the Costa Mesa area, we highly recommend this place for a great start to the day. Just around the corner from the bakery in the same shopping complex called “The Camp”, there’s a place called Project Juice. Swing by here to pick up a Turmeric Nut Milk. We didn’t care for their juices but loved the milks. 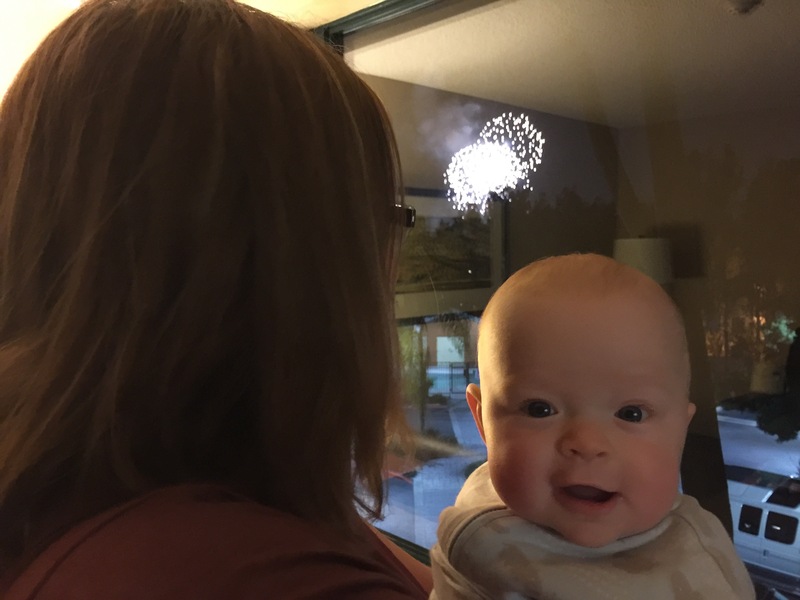 It’s a great “pick-me-up” for someone like me who can’t have caffeine while breast feeding. After a relaxing stroll along Seal Beach, it was time to hit the Long Beach Promenade for some grub. First, we stopped at The Blendery to sample some delicious beer that our friends helped to make by delivering some fresh ingredients from their personal garden (how cool is that)! Definitely try this place and check out the kegs in the back! The beer was an amazing blend of fruit and ale – really, you have to try it! After our thirst was quenched, we headed next door for some fantastic BBQ at Beachwood BBQ. Omg: The Pulled Pork Sandwich! Perfectly cooked meat with slaw on a pretzel bun. Thank goodness for friends who show us where the good restaurants are! GO.HERE.NOW! We will be back. I want to try everything on the menu. Day two was full of fantastic wedding activities including a wonderful 8 course dinner. We won’t go into a ton of details here, but just know that we fully enjoyed each course of Vietnamese delicacies including a light, fluffy mocha cake at the end. We woke up on day 3 ready to explore more food so we met our friends from the wedding for brunch in the Little Saigon area. Brunch Pho and coffee at Pho Kim Quy in Fountain Valley was a perfect start to the day followed by Fresh sugar cane juice and avocado smoothies just down the road at Nuoc Mia Vien Tay. After coffee (I just had a few sips…. ahhhh I miss caffeine) and sugar cane juice I felt like we could run a marathon….the sugar crash later was pretty epic. Side note about Vietnamese coffee: If you haven’t had cà phê sữa đá before – put this on your list. It’s an amazingly smooth blend of delicious STRONG iced coffee and sweetened condensed milk. The first time I had some I went straight out and bought some along with the coffee strainer so I could make a single cup for the afternoon slump at work. Its a bit like a coffee dessert – try some… you won’t be disappointed. Brodard’s Restaurant in the next complex over was the next stop for Nam Nuong to go for a snack a little later on. These rolls of crunchy goodness are a perfect way to curb afternoon hunger pains and were great to take away for later. At this point, we opted to skip dinner and head out for a walk to Downtown Disney to try and burn off some of our delicious calories from earlier that day. Once we got there, we stopped at Sprinkles for a cupcake dessert that was the cherry on top for this day. The next day brought us back to Little Saigon starting at Quan Hy. The banh beo and the mi quang were my favorites – the banh beo is a delicious savory rice starter while the mi quang was a perfect noodle dish with a small amount of soup at the bottom as well as shrimp, banana leaf and fresh herbs. This was the first time I have tried any of these dishes and was told that this restaurant had high quality offerings. I agreed and will seek out these dishes more often to see how the recipe differs from place to place. One tip for the Little Saigon area: bring cash! Most places are cash only. Our final dish was of course a dessert. Just down the street in the next complex over was Trai Cay Goc Pho where I had an amazing coconut dessert. Fresh fruit, ice cream, whipped cream, and cookies were all piled on a coconut. As a bonus you get the coconut water on the side! The best part is scraping out and enjoying the cold coconut at the end. As always, there were about 1000 more restaurants we wanted to try while we were here. We are excited to return to So Cal in the near future and continue our culinary adventures.